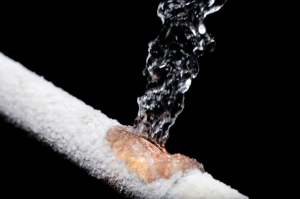 Frozen pipes are a serious condition to encounter in any home or commercial building. The effects of extra cold weather can cause pipes to freeze if proper attention is not taken for preventon. There are many ways to prevent frozen pipes before they freeze or burst, if homeowners follow a few simple steps when extra cold weather is upon us. Keep temperature in the home at or above 40 degrees. During particularly cold weather, leave cupboards under sinks open to circulate the warm air, especially if the sink is built on an outside wall. In many areas of the country, insulation should be installed in basements, attics and exterior walls to help eliminate frozen pipes. Pipes that are located in basements, attics or exterior walls should be wrapped in insulating sleeves or heat tape. Leave faucets on outside walls running at a drip level or those connected to pipes running through an un-insulated basement. Shut off the water supply to any outside faucet bibs. This should be done as part of a cold weather checklist. That checklist should also include shutting off the supply line to a swimming pool, fountain or other decorative elements in the yard. Frozen pipes can be dangerous no matter where they are located. Should any of the methods used to prevent the frozen pipes fail to work, a thawing process will probably need to be administered. The home owner will need to identify whether any pipes are, preferably before they burst. This should also be done before any burst pipes potentially thaw out and cause a flood. There are a number of things that home owners can do to properly thaw out pipes. Most of these ways are safe; some of them will take a while. The following list assumes that all frozen pipes are in reach and not hidden behind walls. If they are, a professional plumbing company should be contacted as they have the equipment and skill sets to both thaw the pipes properly and repair the necessary damage to the walls. Here are several methods for homeowners to thaw accessible frozen pipes. Each method begins with making sure the faucets on the effected pipe(s) are open to allow the expansion of the melting water to flow out and work begins at that faucet. Wrap frozen pipes with towels, soaked and drained with hot or boiling water, every several minutes until water starts to flow. Wrap a heating pad around the pipe. Use a hair dryer. Set it on high and keep moving it back and forth around the pipes. Carefully using a space heater in the room with the frozen pipes will assist in thawing them out and helping to dry the area. A propane or other fueled torch can be used if the home owner has experience with this tool. However, this is a dangerous method and must only be undertaken in last case scenarios and again only if the homeowner is experienced with the tool. Your local New Jersey plumbing company should be consulted before this process so an emergency service call can be avoided. All Jersey Mechanical has been providing residential plumbing, electrical, renovation and construction services since 1994. We can help NJ homeowners repair and replace frozen pipes for an affordable and competitive price. If there is a plumbing problem in your home and you think professional attention is necessary, book your service call through our website and get 10% off. Click here to get started!